Yesterday late afternoon, heavy rains came in. It was coming down in large sheets with a heavy wind behind it. The thunder and lightning in the distance was intense and the rumbling of the thunder never stopped. It slowly moved our way. I knew that we were going to have some serious weather because I am constantly watching the radar across the nation. The rain would intensify at times to where our gutters were useless. The water was just pouring over the edges of our roof. Puddles were forming in the yard and they quickly turned into little rivers rushing down the slight grade of our yard. I was enjoying myself as I always do because I am a serious lover of storms. It was quite invigorating. As I was watching the sky I received an alert on my tablet about a tornado warning that would affect our area. Apparently a funnel cloud had touched down in a town nearby and was heading east. I knew that meant it would not come to where we were but I was still on alert. As I gazed up into the sky I saw that the upper-level clouds were moving in a northeasterly direction; the lower clouds were moving southwest almost in a circular fashion. I knew what that meant. When you have crosswinds rotating and clouds drop down, a funnel cloud can form. Having lived in Iowa for a number of years, I had experienced, first-hand, tornadoes. After a short while the winds returned to traveling in a single direction and I was relieved. As I sat on my deck watching the storm, I could not help but think about the horrific devastation in Texas with so many people suffering from the flooding and how long the recovery process will take. I am sure there will be some people that will never recover from something like that. How could you? All this long week, my thoughts and prayers have been focused on them. But I had to turn my thoughts away from that. It’s just too overwhelming. I turned my attention back to our storm. Throughout the rest of the afternoon and late into the night I continued to observe the weather. That night around 9 or 10 I don’t remember, I was sitting on my deck as usual and started to hear a very strange animal sound. I have been living here since 1993 and I am very familiar with most of the animals that live here. I know what they look like and what they sound like. I cannot recall hearing the sound I was hearing before tonight. Of course my curiosity was piqued and I had to figure out what that was. I grabbed my earbuds, plugged into my tablet and started searching for North Carolina frogs and toads. I was pretty sure it was one of those. I found a really cool North Carolina herpetology site and on it there were about 28 different frogs and toads. So I clicked on each one, one at a time, and scrolled down to the bottom where there was an audio file of the call of that particular species. After looking through just about all of them, I came to the next to the last one. 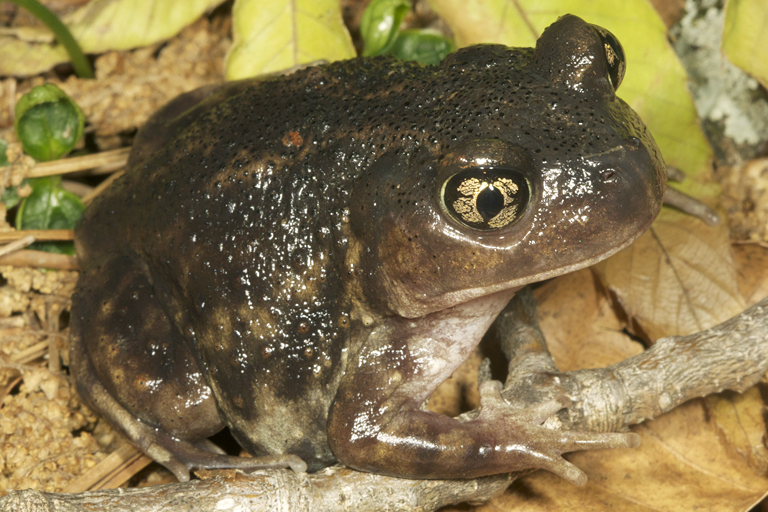 It was the Eastern Spadefoot. Oh my gosh! It was the toad I had been hearing! This particular toad digs itself backwards into soft sandy soil and spends most of their lives underground. When extremely heavy rains occur they come out and start mating. Well I guess they were having a heyday in our woods last night! There were many of them calling. I told my husband I was going to grab my raincoat and flashlight and go out into the woods so I can see them. The woods belongs to our neighbor and my husband said that he did not think that would be a good idea. If they looked outside and saw somebody lurking in their woods with a flashlight late at night they might get a little disturbed. I had to agree so I just enjoyed the sounds they were making. The rain finally ended early this morning. We participate in the CocoRaHS program and my husband reported 3.95 inches of rain at 7 a.m.! Here’s a link to that program in case you might be curious: CoCoRaHS It’s a national program that started and is run by Colorado University. They started many years ago and we joined about 10 or 12 years ago. Every morning at 7 a.m. we report our precipitation even if there is none. The information is gathered and collected and put into databases where the National Weather Service and other weather agencies can determine precipitation statistics as well as drought areas and I am sure a whole lot more. If there is a sudden inundation of rain we report that immediately so that local weather folks can ascertain flooding possibility probabilities. CoCoRaHS is constantly looking for more volunteers throughout the country as well as in Canada. (Hint hint). So right now, it is very foggy out and the clouds have not lifted at all; so it’s kind of dark. A few scattered storms are expected today but it all should clear out by tomorrow. Here again, another opportunity presented itself to me to observe and appreciate the natural world. I know that nature can devastate. But without her, life could not exist. Out of the ashes rises new growth. Out of flood waters, life will begin anew. Weather catastrophes, I know, have occurred throughout history and they are nothing new. I sense in my heart that these kinds of catastrophes are probably going to increase in frequency and intensity. But no matter whether it is weather or human destruction and violence; of one thing I am certain: I have nothing to fear. My Father in heaven loves me and will protect me until the time comes for me to rest and wait for that great day of His return. Be strong and of a good courage; be not afraid, neither be thou dismayed: for the Lord thy God is with thee whithersoever thou goest. Joshua 1:9. Another day, another life-giving, beautiful day! This entry was posted in Faith, God, Heart, Nature and tagged blessings, Faith, following Christ, Frogs n Toads, God's love, Heart-led, Heaven, hurricanes, life, living life, Mother Nature, Storms, struggles, Wildlife. Bookmark the permalink. That toad’s eyes look like flowers! What a great post Linda, action packed and full of joy and wonder. I could feel how much you wanted to go out there and find those critters, I would have too. And my husband would have reined me in, just like yours did. It’s hard to have to respect neighbourhood boundaries when some new mystery beckons .. we’re peas in a pod you and me.